Folding table tennis tables are the preferred choice for those who may have space issues. Below are the best selling range of folding table tennis tables from different manufacturers that you may find handy for your needs. 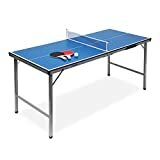 This Fantastic Wollowo Green 3/4 Size Junior Table Tennis/Ping Pong Foldable Table with 2 FREE bats and 3 FREE balls would make a great birthday/christmas present for the kids, it will keep them entertained for hours at a superb price. Size: L: 206 (81") x W: 115 (45") x H: 77cm (30"). Table thickness: 4cm (1.5"). Folded size: L: 115 (45") x W: 8.5 (3.5") x H: 120cm (47"). 12mm (0.5") MDF top with 15 (0.5") x 30mm (1") square powder coated steel frame, legs are 30mm (1") round powder coated steel tube. Easy to assemble, can be ready to play in 5 minutes!. Can be easily moved along on wheels when folded up. Fits easily in garage with room around it to play the game;It was easily assembled, is very stable but can be moved without much trouble. Play ping-pong anywhere in your home or garden - Fun for the family, whether on the go or at home! 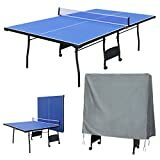 Includes 1.5 m Table, Net, 2 paddles and 3 sets of table tennis balls. Easy to mount, store and carry. For children aged 8 years and above. 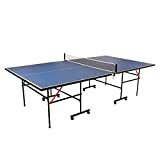 Play like a table tennis pro with this professional full size folding table tennis table. 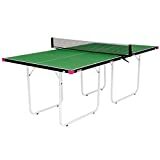 This table tennis table comes complete with a high quality, durable net, with 2 spring loaded, removable post, as part of this really great package. Together, all this makes our table tennis table a fantastic and affordable present for both children and adults of all ages. This Item can be used outside, but is best to be stored inside or in a warm dry place.